We’re All About Birds This Summer! Featured » We’re All About Birds This Summer! We are celebrating all things bird alongside the International Ornithological Congress and Vancouver International Bird Festival on August 19-26, 2018. Sigh-up for a tour or workshop. Covering science and sightings, we will be hosting a variety of tours and workshops that will allow you to experience ecology all around us through birds! There will be something for everyone, from experienced bird experts to families and curious beginners. Tours will be led by local bird experts with a keen eye and ear for the birds in the Park. Get an insider’s look at secret bird behavior on a 4 hour guided walk with a studied expert, or stop and watch the birds (as you smell the roses) on a 2 hour walking tour of the Stanley Park Rose Garden. Those looking for something a little bit different can sign up for a truly special experience to camp out with us in Stanley Park. 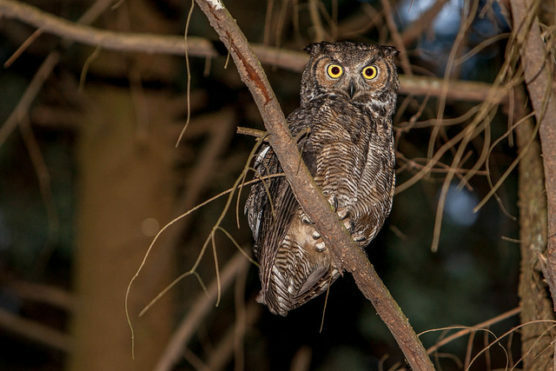 Get a front row seat to the Park’s forest orchestra: listen for barred owls and great horned owls deep in the woods and wake to the dawn chorus of Swainson’s thrushes, pine siskins, Pacific wrens and more. Spot beavers and bats emerging at sunset and learn about other Park wildlife with your local guide. We’ll also be debuting our new Mobile Nature House as part of the Bird Week Expo from August 21-24 at the Vancouver Convention Centre. Providing a little piece of Stanley Park wherever it goes, the Mobile Nature House will allow visitors to explore some of the Park’s favourite creatures up close, keep you up to date on current happenings, and show you where to go to see your favourite birds in the Park.